Ford Ireland’s Innov8 car and van sales promotional campaign is rather timely in that it not only involves the present line up of models but also looks into the short term future. At the Go Further experience event in Amsterdam last week, Ford Europe premiered eight new models that will enter the marketplace inside the next 18 months, with eight more to follow. So, eight being the operative number with innovation joined by electrification as the key words for the brand going forward. For Ford’s commercial vehicle customers the event was all about newly developed hybrid and fully electrified vehicles, connected services and strategic partnerships that Ford aims to deliver greater productivity, efficiency and economy, with a strong gloss of environmentally friendliness as well. 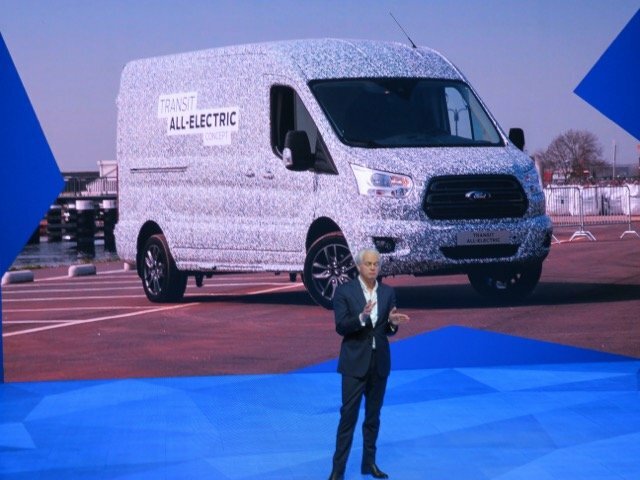 Among the highlights among the cars and commercials launched was a working prototype vehicle – the new all-electric 2-tonneTransit, which will enter production in 2021, co-developed by an Limerick native Ger Cronin, a specialist engineer at Ford in Cologne, Germany. It will contribute to cleaner, quieter towns and cities, and reduced running costs for commercial vehicle users. Designed to address the needs of urban operators for a practical and versatile load-carrier with zero-emission driving capability, the all-electric Transit will be available in multiple body styles, with a competitive payload and built-in connectivity, delivering full Transit capability and durability. The electric powertrain is being engineered to provide a practical daily driving range for city-based businesses, to be maintained in all weather conditions and throughout the working life of the vehicle. Presently, through its joint project with StreetScooter, Ford is providing an all-electric solution targeted at the last-mile delivery sector in the city environment. The Transit-based StreetScooter WORK XL, assembled at the Ford plant in Cologne, features an all-electric powertrain and is currently in service with Deutsche Post DHL in Germany. 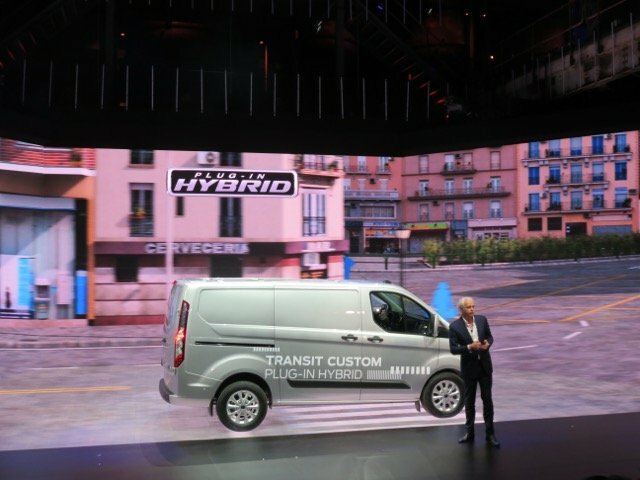 For operators that need to travel in and out of low-emission zones in urban areas, Ford’s Transit Custom Plug-In Hybrid van offers zero-emission driving capability with no range anxiety. Ford is the first volume manufacturer to offer plug-in hybrid technology in the one-tonne van segment, and the new model will go on sale in late 2019. The Transit Custom Plug-In Hybrid’s front wheels are driven exclusively by an electric motor/generator, powered by a 13.6 kWh lithium-ion battery pack, with Ford’s multi-award-winning 1.0-litre EcoBoost petrol engine acting as a range extender. The advanced hybrid powertrain targets a zero-emission driving range of up to 50 kilometres or 500 kilometres in total. To better understand the benefits for the environment and for customers, the vehicle is currently being trialled in London, with further field tests to begin in Valencia, Spain and Cologne, Germany. This petrol-electric hybrid panel van will be joined by new Tourneo Custom Plug-In Hybrid. The eight-seater people carrier is perfectly suited to executive shuttle services, operating in stop-start urban or suburban conditions with its 48-volt mild hybrid technology. Ford’s segment-first EcoBlue Hybrid powertrains will be available in the Transit, Transit Custom and Tourneo Custom models from mid-2019, delivering reduced running costs for operators. EcoBlue Hybrid technology delivers a fuel-efficiency improvement of around 3% compared with the equivalent 2.0-litre EcoBlue diesel model, based on WLTP analysis. Increased benefits of up to 8% can be achieved in applications featuring a high proportion of stop-start driving, for example during urban delivery operations. Also announced at the “Go Further” event is that Ford is developing a predictive maintenance programme with the aim of delivering 100% uptime for vehicles. Promising to revolutionise the way commercial vehicle customers think about servicing, the new solution will enable maintenance to be tailored for each vehicle, rather than being determined by fixed service intervals. Sensors on key systems provide real-time data, so service attention is only given when required, and action is taken before problems become serious enough to cause a failure. Using a convenient mobile phone app, business owners can check on the status of every individual vehicle, and drivers can see live and predicted vehicle health data. Servicing and maintenance work that might normally be carried out in separate visits can be intelligently bundled together, minimising time off-road.For larger operators, the Ford Telematics product being introduced this year provides fleet managers with key decision-making data to optimise business performance.Providing real-time manufacturer-grade information sourced directly from the connected Ford vehicles in the fleet, routed through Ford’s Transportation Mobility Cloud, Ford Telematics enables managers to view data about the health, efficiency, productivity and safety of each vehicle using a desktop application, and quickly assess where action needs to be taken. Firstannounced last year, Ford Data Services provides large fleets with the opportunity to receive a tailored package of data from their vehicles via the Cloud and integrate it seamlessly into their own systems. Ford is also focusing on the needs of small businesses and owner-drivers. The FordPass app is already being relied upon by vehicle owners, and provides a range of practical features to enhance convenience, security and efficiency. This includes new features tailored to business users, such as a parking feature that facilitates filter parking locations based on the height of the van. Later this year Ford is launching the all-new FordPass Pro app, specially targeted to small business owners who have between one and five vehicles, providing owners with the information and tools needed to ensure the vehicles are ready for work. Strategic alliances for the future include expanding the company’s Qualified Vehicle Modifier (QVM) programme, now at 100 QVM-accredited converters in Europe, is set to double this number by 2020. Every QVM partner has unique access to manufacturer-grade vehicle information, and Ford works closely with the partners to deliver more flexible products, such as the low-height Transit Skeletal chassis launched in 2018.